I stopped by an art gallery a few years back and saw a painting on the wall that was huge, but almost entirely one color with just a very small sliver along the bottom that brought the whole thing into perspective. It was an interesting concept, but I didn’t really care for it as a whole since if it were hung on the wall in your home, you would simply see a very large rectangle of one color until discovering the detail of the objects along the very bottom. It wasn’t long afterward that I happened to get up one morning and saw what appeared to be a cold front passing through with some very angry clouds on it’s leading edge, and since it was near dawn, I grabbed my camera. 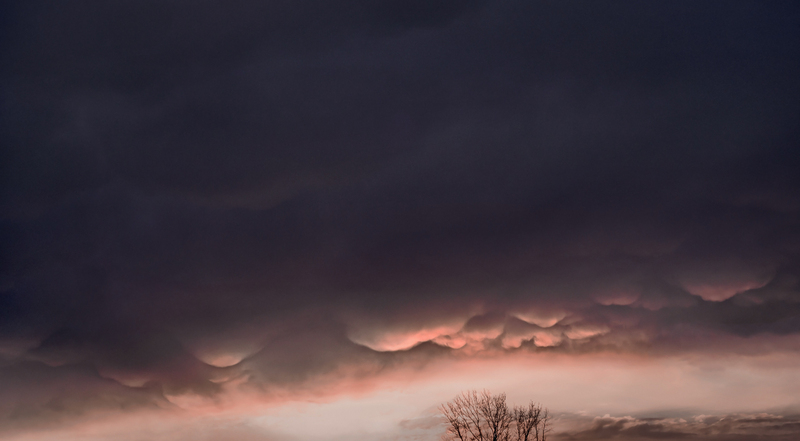 As the sun began to illuminate the clouds with an odd light, I did my best to hand hold a few shots. I didn’t want to include the rooftops of the nearby homes, but did include just the top of a few trees that luckily, lined up just where I would have wanted them to be even if I had the freedom to move to either side of where I stood. It was the painting that I had seen previously that inspired me to take this shot with only the treetops giving the whole image a bit of perspective. Although more of the sky was originally included for the whole solid block of color idea and sliver of reality along the bottom edge, I ended up cropping some of it out for this post, but still like the full image as well since the clouds contain some differing values rather than simply one homogenous color. In addition, since there was so much contrast between the leafless branches and the sky, many of the thinner branches were blown out so they had to be “remanufactured” in Photoshop. I would have like to have had the time to use a split neutral density filter and a tripod, but time didn’t allow for that. Working on the limbs was a bit tedious, but was done in a way that created a more painterly interpretation rather than the literal view of the camera in keeping with the artwork that inspired it. It’s rare, when after you’ve identified a great location for a sunrise or sunset, that the forces of the universe line up properly on that particular day you’re there, and actually get that great otherworldly sight you’ve always sought. But when it happens, it’s pretty thrilling. 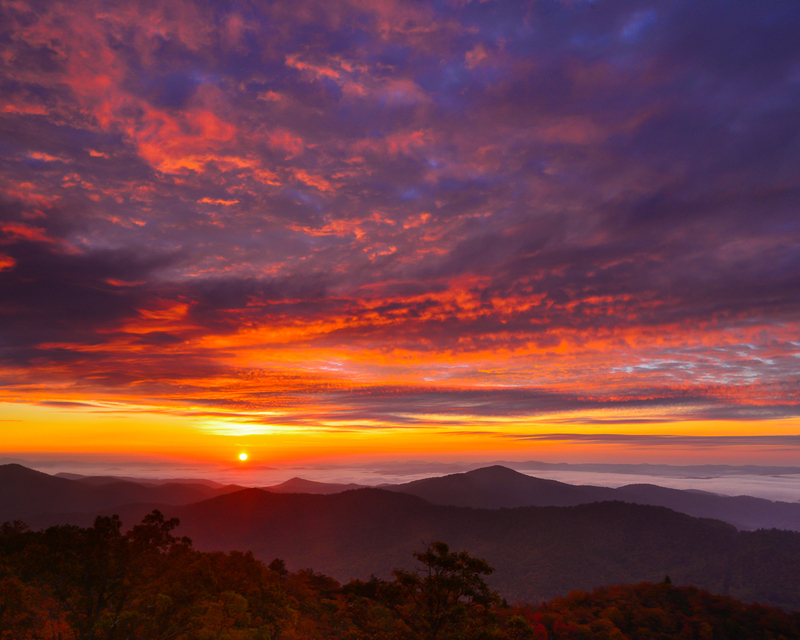 To see a sunrise or sunset like the one above in solitude is icing on the cake. The reality is if it’s a great spot, solitude most likely won’t be in the cards. As was the case here, I shared the experience with about 40-50 other photographers lined up, shoulder to shoulder, along the parking lot, tripod legs intertwined. There are advantages to the solo experience in that you feel you are witnessing a remarkable event in the timeline of the earth; you feel more connected. The crowd on the other hand, offers a bit of camaraderie in a shared experience and the opportunity to talk to others of like mind; but the strong connection to the sunrise or sunset is somewhat lost. Of the sunrises included here, I felt a stronger connection to the first even though I was not in a remote location surrounded with a sublime landscape, but never the less felt I was witnessing a unique event in the earth’s history. The location of the second was much more powerful and majestic, but the crowd made it feel like I was a fan in the stands at a sporting event. I was thrilled when the clouds lit up pink just before dawn and was in total awe as the sun rose above the distant horizon, but the personal relationship with the event was slightly bittersweet. Occasionally, you see things that are not in your usual subject to photograph, but there is something compelling that pulls at you to break out the camera and record it anyway. Generally speaking, I consciously try to keep my landscape work free from indications of civilization or evidence of human presence. Boy! was that ever difficult when most of my photography centered around the landscapes of New Jersey. There were many times where I’ve had to clean up picnic trash or cigarette butts, fish old tires out of lakes and, since it was before Photoshop and digital, I even tried to keep lit street lights out of shots that were taken before dawn or after sunset. 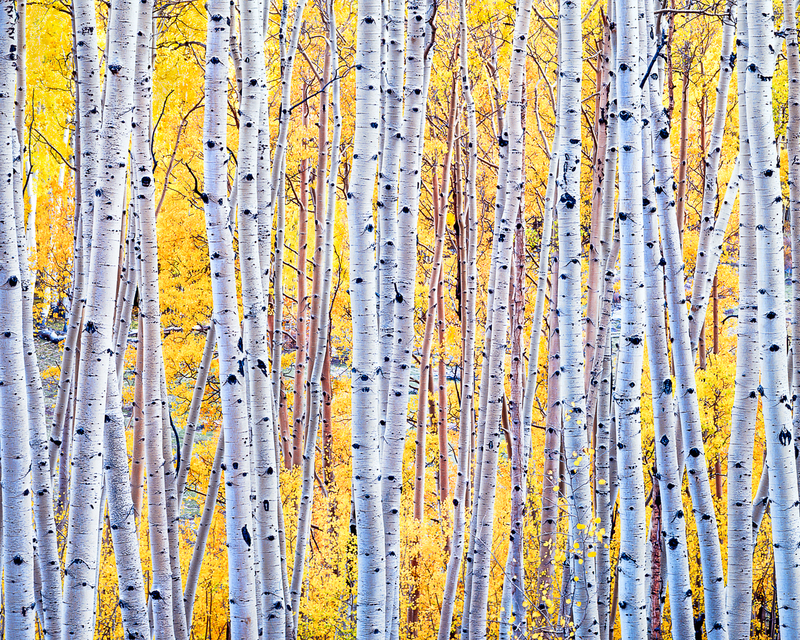 But seeing this small group of aspens along a fence had something special in the lighting and in their leaves. Every leaf had a bit of brown around its edge, creating an almost iridescent glow and combined with the soft lighting of the very late afternoon shade, I was able to overcome my initial reluctance to photograph them because of the fence. Yet, I did look at them for quite a while before pulling out the camera. A lot of things went through my mind, which looking back at it now, I should have just taken the shot without all those deliberations. I guess it was just a throwback to my film days when every shot constituted an expense! The Fence? (Absolutely No! ); I knew it would probably be the last shot of the day and had a long nighttime drive ahead of me to get to Lost Lake before sunrise (move on, don’t bother with the shot); the light was dimming rather quickly (don’t); there was a slight breeze that may have made it difficult to get all the leaves perfectly sharp and in focus (no); and it was a bit monochromatic (again, no). Obviously, I still took the shot in spite of all the negatives. Luckily, I still had the use of my cable release to allow for the patience needed to wait for the breeze to let up enough to trip the shutter when the leaves were still. It seemed that whenever I hit the shutter button the first time to raise only the mirror (to reduce camera shake), it was also a signal for the breeze to pick up again!!! I ended up with many attempts, several of which I thought had been successful in taking the photo at just the right moment of calm. But it turned out none had all the leaves still and crisp; this was the best of the lot. In hindsight, I should have boosted the ISO and opened up the aperture a bit in order to increase the shutter speed resulting in a bit more success getting the leaves without movement. But at the time, as is usually the case, I tend to use the lowest ISO I can to keep noise to a minimum. I should have realized that there probably wouldn’t be a problem with noise since there were hardly any deep shadows and contrast was minimal. So, next time I’m there (which will probably be never) I’ll be sure I get a faster shutter speed one way or another. Lesson learned. It wasn’t much later on that the connection for the cable release somehow broke free from the camera body, “floating” inside, and I wasn’t able to connect the two any longer. From then on, for the remainder of last year’s west trip, I was relegated to using the self-timer, making the use of the mirror up feature useless and leaving the precision I like to have when tripping the shutter left to chance. Shooting stationary objects is not the problem, but shooting trees with any slight breeze and the lag in the shutter release with the self timer leaves too much to chance. Now, I try to keep the cable connected to the camera as much as possible, even leaving it attached when I pack it back up in the bag. As far as the placement of the trees within the frame, the shot almost composed itself. Because of the nearly perfect symmetrical shape of the group, they almost had to be placed directly in the middle. All the lines of the fence and meadow’s edge lined up while the vertical and parallel trunks seemed to work with everything properly placed in the center. I would have liked to have the other vertical fence post perfectly positioned to the left as one was to the right, but I guess the trees just grew in the wrong place for that. Trying to get the posts centered left them partially blocked and bothersome. So I tried to block one out completely and only blocking the one on the left worked out. The fence was what bothered me most in taking the photo of the aspens. 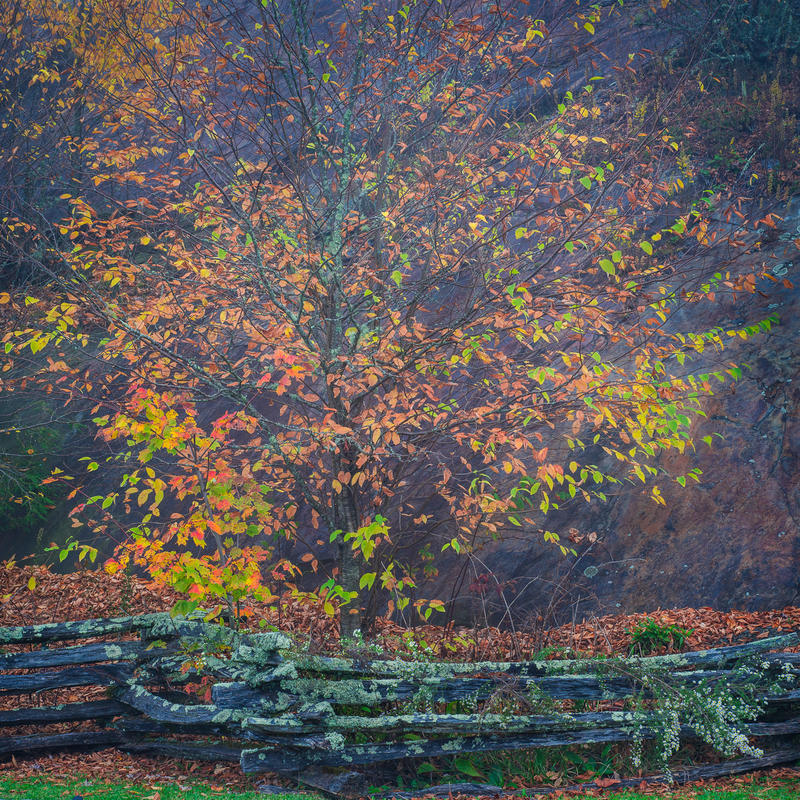 It was a similar situation when I saw a beautiful tree with autumn leaves against a stone wall in Smoky Mountain National Park. The problem was that I could not in any way eliminate the fence that was just in front of the tree. Because of it, I really didn’t want to take the picture, but again, it was a tug that just made me get the camera out of the bag and take the shot. Sometimes, you just can’t resist. Because I took that shot, the fence led me to another spot along the same slate wall that was included in the recent “Revisits” post where I was able to avoid that dilemma and get between the fence and the slate wall. In the last post I mentioned something about being able to get rocks to take on a blue tone. To follow up on that, my initial discovery occurred when I looked through my processed chromes from a fall trip to Maine’s Acadia National Park back in the mid-90’s. I found myself at Otter Point one late afternoon on a clear blue sky day and discovered some great photo opportunities, including loads of great abstracts in both the rocks and tide pools there. 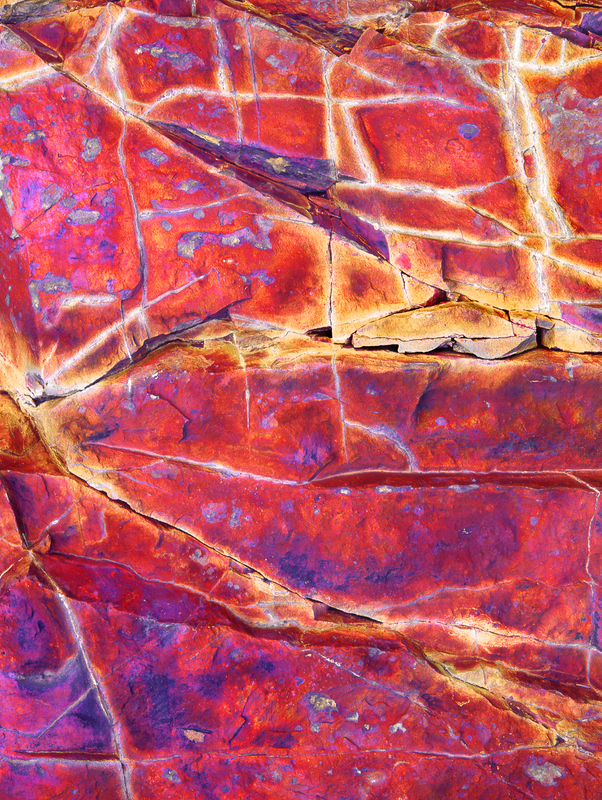 Some of the rocks had a kind of metallic sheen to them with what appeared to be water stains along many of the cracks. 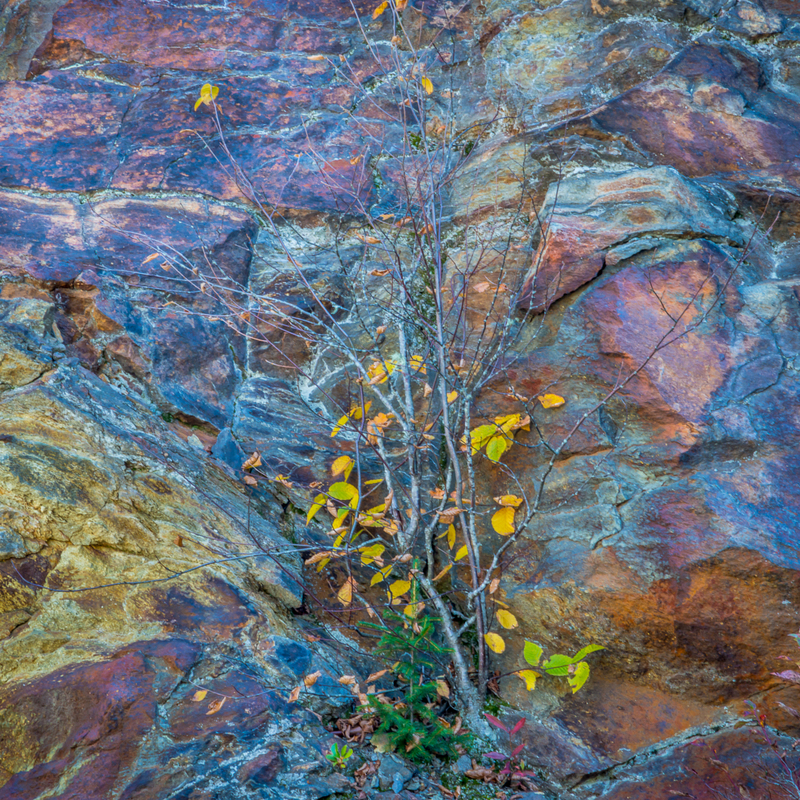 I took some shots of these rocks, only including areas in complete shade to even out the contrast and “flatten” the image. To my back was the eastern horizon, so the sky was not affected by the red and yellow from the late day sun, and was a beautiful, deep blue. The western sky was completely blocked out by the wall of stone. When I looked at those chromes later, I thought they had someone else’s film mixed with mine!! Where did these images come from? It took a few minutes to realize that these were the shots from Otter Point! The (unaltered) image above is typical of those that had really picked up the blue from the sky and in the shade. 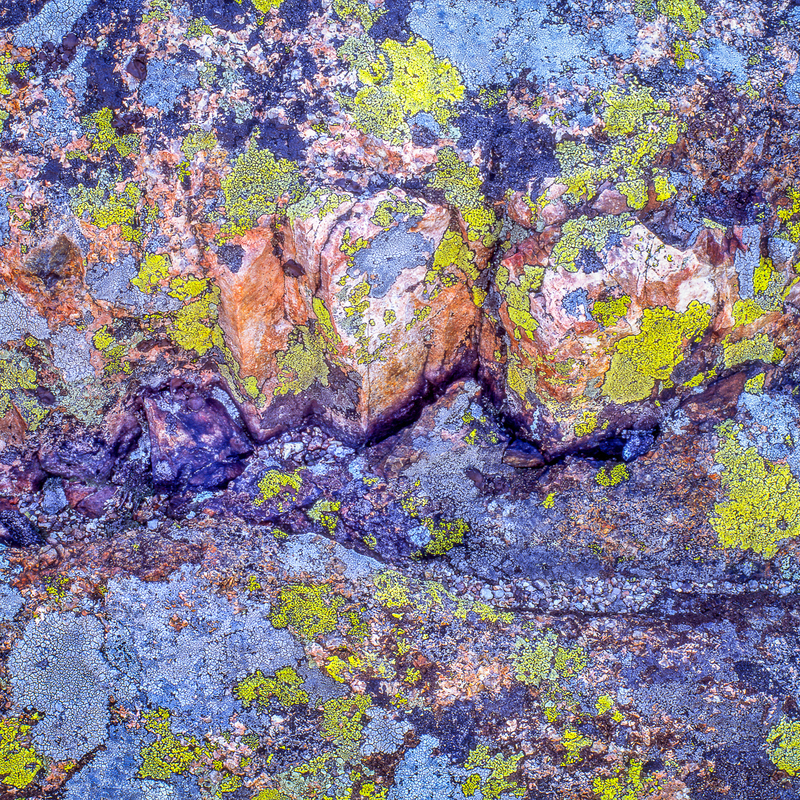 Another abstract image of the pink granite and lichen on Cadillac Mountain (also taken in the shade, but early morning with my back to the west) resulted in a bluish cast picked up by the lighter gray lichen on the rocks. Although these two examples were totally unexpected, I eventually used this information when taking shots in the same conditions, but now expecting that certain parts of the image would be rendered with a blue cast. When you create abstracts, it’s pretty obvious that you have allowed for the creative to completely overtake reality. But the creative doesn’t have to stop there in the field. By changing the hue for individual colors, or the entire image for that matter, the creative can continue from the field into the digital darkroom. That’s what was done to create the red version of Rock Stains seen here. Since neither the original blue or the red are anywhere close to reality, you can go as far afield as you wish to take it. The only limitation is your nerve in pushing those limits, or sliders, whichever the case may be. These same conditions can come into play for photos of just about anything. This final picture is of a metal water tower made of cast iron from the 1800’s. 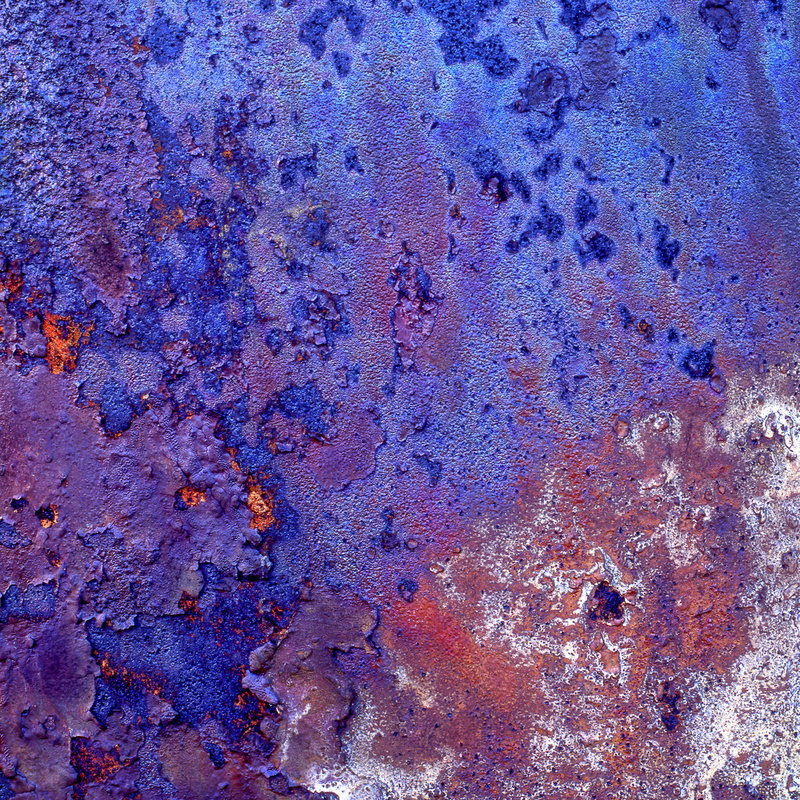 The oxidation of the metal had some small rust spots, but most of it had a sheen similar to the rocks of Otter Point. The white area is very old, weathered paint. The same conditions applied (my back facing east…clear blue sky…late afternoon) and I took the shot, this time knowing the metal would most likely render blue in the chrome after it was processed. Sure enough, there it was when I got them back. Today, you don’t have to wait, you get instant feedback after the shot is taken and can make judgements and adjustments to the results right then and there to get exactly what you want. It’s important to note that it’s one thing to look for this and incorporate it into your vision; it may also be important to know when you don’t want the blue cast to show up and either avoid those conditions or compensate for them by making the appropriate changes to your white balance setting. But, I suppose even that can be corrected in post processing on the computer so much easier than when it was film. When I first switched over from film after buying my first real digital camera about 3 years ago, I knew very little about the digital darkroom. But what really shocked me was viewing my images on the computer after having shot everything in RAW format, as I learned you should do in order to get as much information possible when you trip the shutter. To say I was disappointed by what I saw was a gross understatement. The relatively dull, lifeless RAW images on the screen were nothing like I had seen through the viewfinder! Some of my first photographic work done with a computer was scanned film and I was able to compare on-screen with what I could see in my medium format chromes. Now when I begin to work on an image, since there is such a vast difference between what I’m seeing on the screen and my recollection, I’m relying on that memory. Originally I thought that was not the optimum method, but have now reconsidered to find it to be one in which your own personal vision and emotional response to the location has a better chance of finding its way into the final version. There is a liberation in that; being free to let your own creativity take hold, whether you’re trying to be true to the original scene or stretching that a bit. My initial limitations and lack of knowledge in the workings of Lightroom and Photoshop were, over time, replaced with a better understanding of what was possible using particular methods and tools within each application after watching many, many youtube instructionals, online workshops and reading books on the subject. I now feel confident enough to try to correct areas of past photos that have gnawed at me because of my inability to correct a particular area to my satisfaction, and have begun revisiting some of them. In the first (film) image, the leaves in the top left were a bit blown out, drawing the viewer’s eye to that corner (at least in my mind). My initial attempts at darkening left them appearing flat, having a gray, murky look and were just as distracting to me as when they were brighter. So I repaired them as best I could. Recently, in an attempt to correct what I viewed as a small problem, I discovered that lowering the exposure a bit less, adding a color, warmer temperature and a few other tweaks to the brush used in Lightroom, I was able to lower the light value, keep the texture and create the original color of the leaves that was there without dulling them down. At last, I was completely satisfied with the final version. To most folks, there might not be a discernible difference between the original and the final, but to me, it bothered me enough to attempt a “fix” when I had finally acquired the ability to do so. 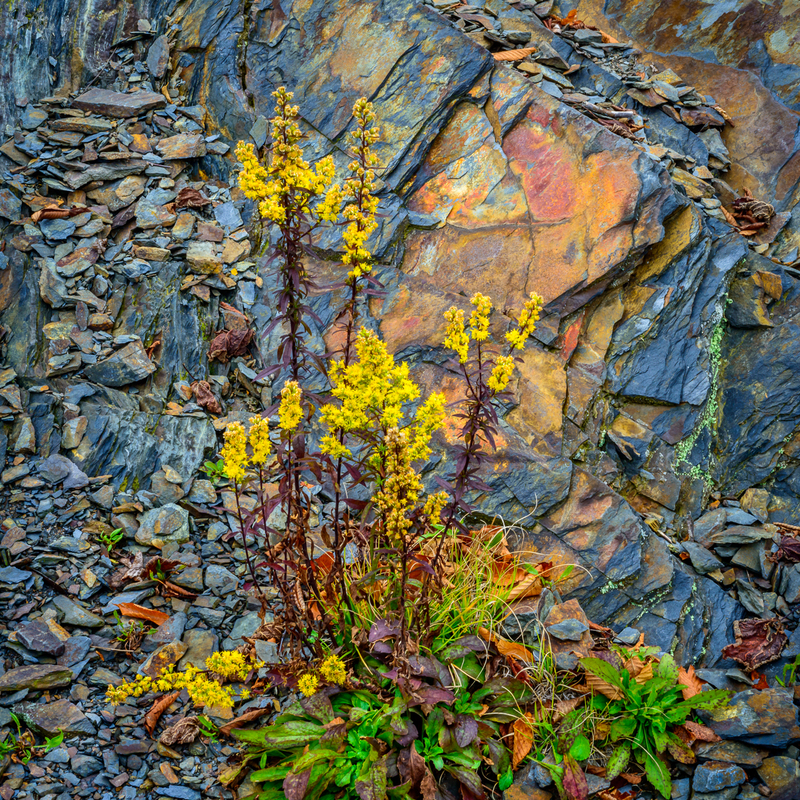 In the second image, I learned a bit about sharpening and incorporated that into this image even though it was sharp to begin with, and utilized the same method of painting in some color into a few of the small rocks that were too bright and distracting for my taste. In the image below, software didn’t really play a major role, although I added some minor tweaking to get the color balance right. Originally, it swayed too far towards magenta so I made a needed adjustment to get it back to reality. I then decided on the square format as a way to illustrate the closeness of the family of firs within the sea of deciduous trees. Using the whole frame, which added another solitary fir on the right, made them seem lost in that “sea”, made the idea of family less immediate and created a double focal point rather than a single one, while the firs took on a secondary role to the mass of the hillside. Sometimes the software doesn’t help much, but the revisit may allow you to realize that the original image does not convey what you wanted to express. 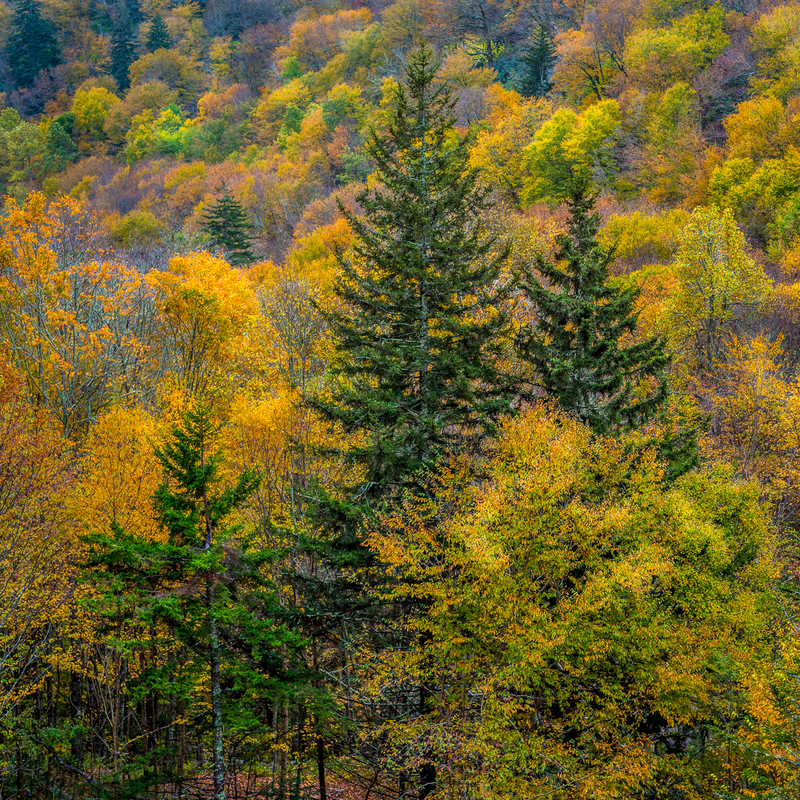 These last three images were from my first trip to Smoky Mountain National Park in the fall just after I got the new camera. What I discovered, in addition to my inabilities within the imaging software, were the realities of using this particular camera and lenses. I had been completely familiar with my Mamiya after 20 years and knew what to expect. Now, I found I really needed to do all I could to eliminate camera shake when using long lenses. A cable release was always used in my film days, mainly because it was a bit awkward to press the Mamiya’s shutter release when it was on the tripod, but I hadn’t gotten one for the new camera to take on this trip. When viewed on the screen, many of the photos that I used an old, very sharp 80-200mm manual focus lens were a bit soft. And as luck would have it, the one image I really liked had that softness!! By using some of the settings I had learned recently to create more sharpness, I was able to bring this image into the realm of acceptability, and may even print it some day, although not in a very large size. I bought a cable release right after that trip! and now use the mirror up feature as much as possible, something that helps in creating tack sharp images using any lens. In addition, I learned how to use very, very local adjustments to make the thin trunk stand out a bit more from the rock. 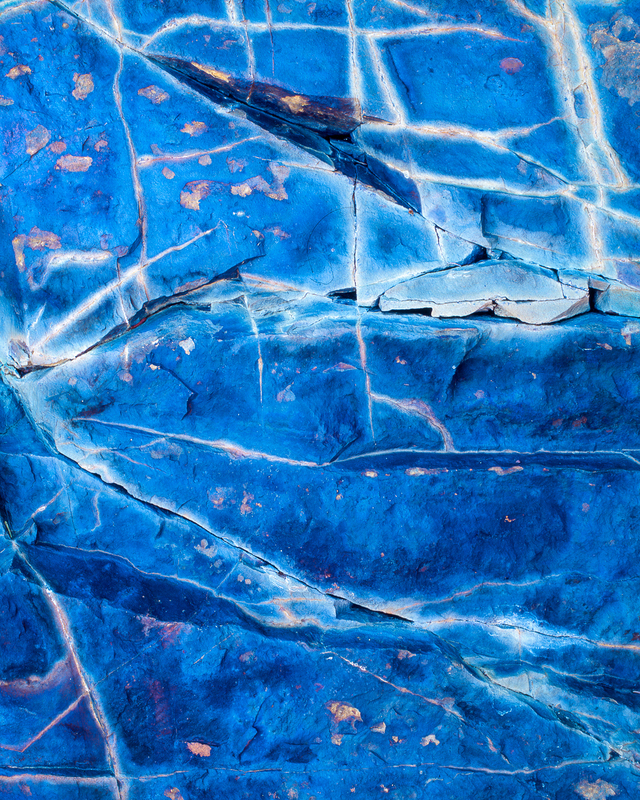 Getting the blue tones in those rocks was something I learned long ago photographing some rocks in Maine’s Acadia National Park. Maybe I’ll get into that in the next post. This last picture was made possible by learning to create space along the edges of an image in Photoshop. By increasing the “canvas size” (under the image menu in Photoshop) along one particular edge, you can add visual real estate if it’s needed. This image was taken back in the late 1970’s, hand held! 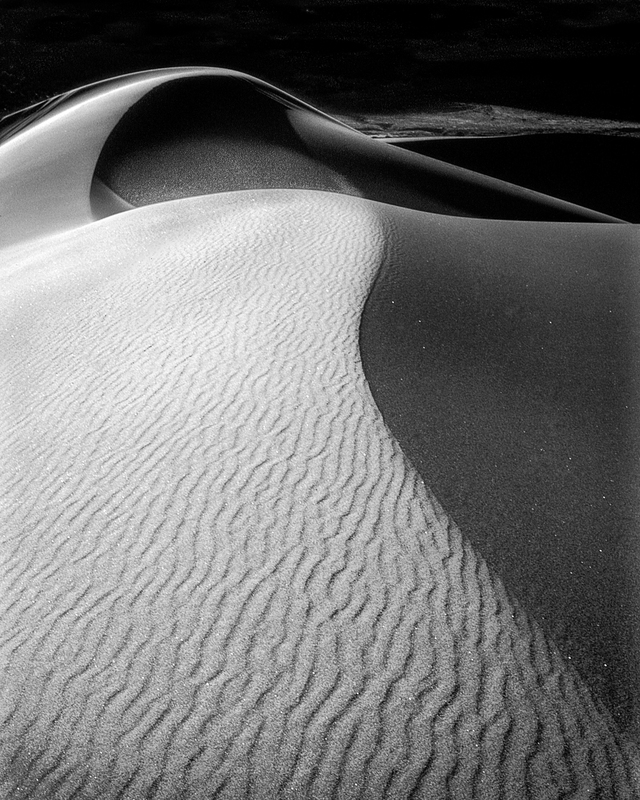 I was able to sharply capture the ripples in the sand, but because the sunlight severely limited what I saw through the viewfinder, I ended up not having enough space above the upper dune. Now, being able to expand the canvas on top and filling it in easily with black using the clone tool, the dune was properly placed within the frame without the original crowding. I also did this in a sunrise photo from one of my earlier posts (Lemonade from Lemons) where I discovered a circle of water ripples at the very bottom edge of the image that occurred while taking the picture, but I never knew it was there until I saw it at home on the computer. That was the first time I ever added space to an image; I added a little to the bottom to eliminate the crowding and took a small slice from the top to keep the same aspect ratio. In this photo, software made changing it into black and white possible with the simple click of the mouse. I hope I continue to learn and improve my post production skills in the future, and believe me when I say I have a long way to go. I also have a long way to go in learning all that is possible with the camera and knowing all the variables available in the vast array of menus and layers within them. But for now, I’m happy just to get what I want on the memory card in order to explore the possibilities that lie ahead.